No one is an island to themselves. Remembering my journey as a Korean-American immigrant. Rejoicing in God’s grace. It’s been emotional as I’ve been reminded of the courageous story of my parents, the future for my children, and the investment of so many in my life. It’s been emotional as I’ve been – again and again – reminded of God’s grace. This weekend, Minhee and I are in Washington DC to attend a banquet to commemorate Korean-American Day in United States history (January 13). Be honest. You didn’t even know there was a Korean-American Day, huh? Each year, the banquet – sponsored by Korean Economic Institute – honor couple Korean-Americans around a particular focus and this year, they focused their selection of honorees around humanitarian work and I was truly humbled to be an honoree along with Kyung Yoon (Executive Director, Korean American Community Foundation), and special guest, Dr. Jim Yong Kim (President, World Bank Group). It’s emotional for me – not because I’ve won some sort of prize or accolade but to be honest, I’m again reminded that I am not an island to myself. I am who I am – even in all my imperfections – by the grace of God. I am nothing with God. I am nothing without God’s mercy and grace. And yes, I am not an island to myself. You see, there is no such-thing as a self-made person. Someone invested in you and that’s certainly the case with me. Many people invested in me and I hope that I can – be and do – likewise for others. I’m thankful for my parents who came to this country only knowing a very words like “Thank You” and “Hello” and “Good-Bye” and yet, they ran a grocery store in San Francisco called “Royal Pine Market.” We lived the classic laborious and unglamorous Korean-American immigrant journey. They got up at 6am to get the store opened by 7am and closed the shop at 11pm. Our family ate nearly every single dinner at this store for several years until we sold it. I marvel and admire my parents – now more than ever before – because I now know how difficult it is to raise a family (and I know more than 3 English phrases!). I admire their commitment, tenacity, and devotion to their children and family. I’m thankful for my wife, best friend, and deepest advocate – Minhee. A simple bullet point would not be sufficient to explain her inspiration in my life. So, feel free to read this. I’m thankful for my two older brothers (Philip & Michael) – who bullied me, babied me, and brother-ed me. They paved the way so that the youngest (aka “Eugene), could have an easier path. I’m thankful for my children: Jubilee, Trinity, and Jedi. I love them dearly and inspire me to live my life as a model for them so that they, too, might be inspired as I’ve been inspired by my parents. I often fear how I’m failing them. All I can do is try my best to love them, teach them, show them – both in failures and successes and everything in between. I’m thankful for my teachers. I had some bad ones, some mediocre ones, and some teachers that I know cared for me deeply. They went beyond additions, subtractions, divisions, conjunctions, and punctuations. They built me up; Inspired me; Demanded more from me. And I’m serious: Teachers are heroes. I’m thankful for my pastors, mentors, and spiritual leaders – for pointing me to the One that informs and transforms everything. I’m thankful not just for the content of what they shared and taught but the content of their character – the latter brought veracity to the content of their theology and teachings. I’m thankful for my team – my staff from Quest, Q Cafe, and One Day’s Wages. Grateful for these brothers and sisters. Grateful for their love and support. Grateful for their prayers. Grateful that they trust me enough to work with me. Thank you Gail, Ray, Katey, Joanie, Jin, Pam, Aaron, Coby, Christian, Anita, Michael, Jill, Sun, Criss, Roxy, and Matt. Thank you Philip & Julia. Thank you to all our interns, baristas, and volunteer staff. I’m thankful for my church – my spiritual family. Thank you, Quest. Minhee and I are truly humbled to have started Quest Church in 2001 and I am privileged to be one of your pastors. I’m humbled and grateful for these people and more who are part of my life. My hope is that in all things, I may bear witness to you. I want to make You known. I want to reveal Your story. may many be fascinated and drawn to Your amazing salvation and grace. Previous What would Jesus do with guns? Not sure why – but your post moved me to tears. Perhaps it’s the awareness that we really don’t know each other’s stories — and if we did we may be surprised by the difficult path. I don’t often share my background – but find people often assume it has been an easy road. Reading about the courageous and pioneering chapters of your life and the lives of your parents was moving. I’m thankful for your story – thankful for the way you use your voice for others – thankful for the tenacity that is a hallmark of your life and ministry and likely wouldn’t have been possible had it not been for your path. Thank you, Penny. Always encouraged by your words and support. You are right…it wouldn’t have been possible had it not been our path. The nectarine! Seriously, I had no idea. The rest is super-cool, too, and they should have also noted the culinary riches – such good food – but for whatever reason, the hard work, music/arts, engineering and medical advances, etc., were not surprising to me but the fruit was! Thanks for sharing your story, and congratulations! 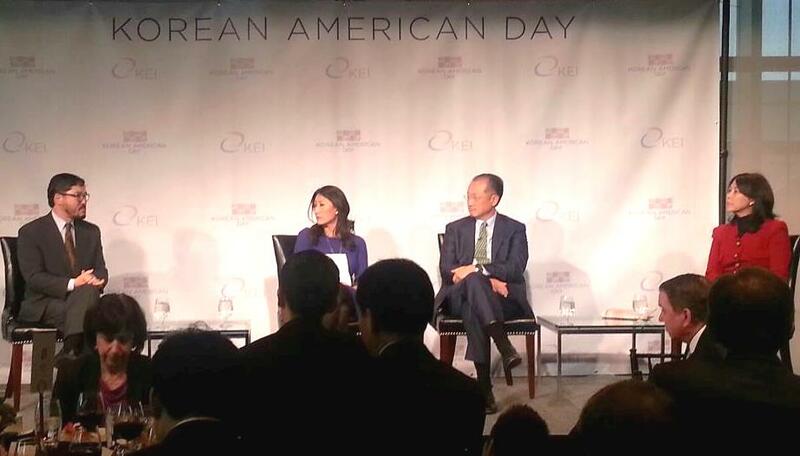 Sadly, I didn’t know there was a Korean American Day. So, thanks for enlightening me. My wife and I adopted two children from Korea, now 5 and 3. Another reason for us to celebrate God’s blessings! And blessings on your family and kids. Thanks, Eugene, for raising your voice and sharing your story. Thank you for showing us all — not only Korean Americans — that our ethnicity is a gift of God, and that our pain can be redeemed by Christ as it leads us to understand, empathize with, and serve others in need. May God continue to allow your story to move mountains for many more years to come. Thank you, Daniel. I appreciate these words. Hope you’ll get a chance to stop by the Midwinter conference next month in San Diego. I loved reading about your family and our culture’s rich heritage. I am Korean American and living in Bend, Oregon where the Asian population is miniscule but we visited Seattle over Christmas and I was in awe of how culturally diverse it was after living here for so long. I’m excited to hear you speak at the Justice Conference and thank you for all the work you do to glorify God in your life and in your community. Thank you. Looking forward to crossing paths at the Justice Conference. If you think Seattle is diverse, wait till you visit San Francisco, New York, or Vancouver (BC). I consider Seattle fairly homogeneous. Well Pastor I have had an affinity for Asians since I was a young child;the culture, the language, all so beautiful, of course as a child I was unaware of the many struggles which many other nations were experiencing, however, I did have some understanding of the African-American struggle. When I was born again in Christ, I often prayfor my Oriental Brethren. I love you guys and I’m proud and celebrate with you all. In the community where my family experienced gentrification is a Korean couple named Mr. & Mrs. Lee whom I’ve come to know and love, I still go by the store from time to time. I remember the first I heard of you some years ago, I forgot I told God I would love to meet you, but HE didn’t. I was so richly blessed and inspired at the JC in here in Philly, and I hope that our Christian connection grows stronger in the Lord, as we fellowship and fight the good fight of faith; we raise the biblical standard of justice for all mankind.